Joker Poker is another popular video poker variant offered at land based and online casinos. The joker is the wild and it can replace any other card. To get a payout, players must get a hand comprised of Kings or better. A pair of Kings is the lowest paying hand, while a natural royal flush is paid the highest. Even though the pay tables of Joker Poker may differ slightly from one casino to another, the game’s usual payout ratio is close to 99%. Players, however, should have in mind that the highest payout ratios are subject to optimal play, so they should learn a strategy associated with particular type of video poker game. To play Joker Poker, make a deposit and click on the game in the casino’s lobby. Choose the value of your bet and the number of coins you wish to play. Then click on the Deal button. You will be dealt five cards and you decide which ones to keep and which ones to give up. Click the Deal button once again to replace the cards that you didn’t choose to hold. The objective of them game is to get the best possible five-card poker hand. 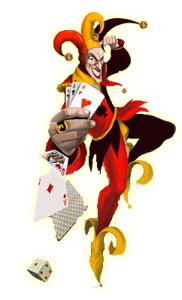 Joker Poker is played with one deck of 53 cards. The extra card is the joker that acts as substitute for other cards in order to complete a winning hand. 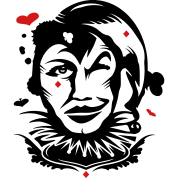 The deck is shuffled after each hand. Doubling: After a winning hand, you can choose to double your entire winnings or double half of them. If you choose doubling, the dealer will be dealt one face-up card, while you will be given four face-down cards. Pick one and if it is of a higher value than the dealer’s up card, your original win amount will be doubled. If not, you will lose everything. When you are playing for real money, find chart strategy and stick to it. Practice strategies and skills in play-for-fun mode before moving to real money play. If you have nothing, keep the highest cards. It is better to keep a King or an Ace than to discard all five cards. Four to a natural royal flush is very strong, so you should give up made straights/ flushes for a bigger payout. If you want to hit the big payouts, play with the maximum number of 5 coins. NEW JOKER POKER 2 – WHAT DIFFERS BETWEEN THE TWO? Real Time Gaming has created another version of Joker Poker. The highest paying hand in both versions is sequential royal flush that pays 20,000 coins. Royal flush is the second best hand that pays 4,000 coins. The biggest difference between Joker Poker 1 and 2 is that the second version enables multi hand format and players can play up to 52 hands at once. Video poker fans from the United States can play Joker Poker I and II at Real Time Gaming powered online casinos that cater to their needs and tastes. RTG software creates games with crisp graphics and nice animations and the games are displayed in high quality. One excellent RTG casino is Classy Coin Casino launched in 2011 and licensed in Curacao. Among the many games available at this casino are Joker Poker I and II and players have the chance to boost their initial bankroll with excellent new player bonuses. The casino offers a number of premium banking methods and its responsive customer support service is available 24/7. BetSoft Gaming software offers the most realistic game play on the Internet and casino fans can play 3D Joker Poker at VideoSlots Casino and Sun Palace Casino that are run by this software provider. Sun Palace Casino is licensed in Curacao and provides excellent products and service, is available to US players and it offers diverse bonus program, high quality security and player support. Joker Poker is easy-to-play and understand video poker variant that can win you a lot of money if you make appropriate choices. 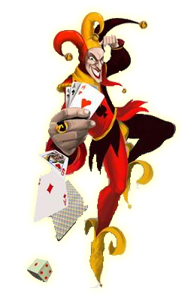 Use Joker Poker chart strategy to get the best payout percentage. In addition, use the joker to make the best possible hand.